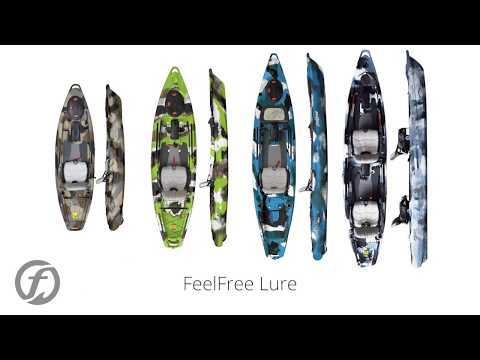 Feelfree Kayaks is taking kayak fishing to a new level with the Lure 11.5 kayak. It still has all the stability, comfort, and versatility as the original Lure 11.5, with the addition of the Overdrive Pedal Drive. The Overdrive features the modern evolution of pedal powered kayak propulsion offering effortless speed, ease of use and adaptability. The Lure 11.5 also includes a variety of unique features including a removable multi-level, multi-position extra wide Gravity Seat, Feelfree's wheel in the keel, and Uni-Track system. The patent pending Feelfree Gravity Seat offers the widest range of seat heights which is adjusted with the simple function of a lever and is removable - the Feelfree Gravity Seat is the new high. The Lure's super-stable 34" wide hull paired with a padded standing platform gives you the option to paddle or cast in either the sitting or standing position whether fishing inland waters or wide open oceans - this kayak fears no water. This is such an incredible kayak! The new built in Overdrive makes this kayak incredible for getting around the lake. I can stand with both feet up on the edge of the Feelfree and it wont roll on me. As a fisherman that enjoys fishing alone, the wheel in the keel makes it incredibly easy to get my boat in the water. And the Gravity Seat is the most vomfortable chair i have ever sat in. I love this kayak. I did a lot of research before this purchase. I looked at the Hobie, the Native and the Jackson kayaks. Price really didn't play into my decision. I just wanted the best kayak for me, and this was it. I couldn't be more happy with my purchase. This is an incredible yak. Q: Does this price include the rudder system? A: Hey there, thanks for the question! Yes, this does include the Overdrive Pedal Drive and hand control rudder. Q: Please explain the wheel in the keel? Is it like a landing gear for transport from vehicle to the water? A: The wheel in the keel is in a fixed position. But it used to transport from the vehicle the water. Q: I noticed from previous questions answered that the package doesn't come with the seat fore-aft adjustment. I am short at 5'7". Would I need to buy the seat fore-aft adjustment to adjust the distance for a comfortable pedal position? Also, can the seat fore-aft adjustment bracket used with the gravity seat bracket at the same time? or Is one or the other? A: The gravity seat is designed to be used in conjunction with that adjustment kit. Q: Does this still include the sonar pod if you wanted to take out the overdrive for a trip. A: The Lure w/ Overdrive does not include the Sonar Pod, but it can be purchased separately and used when the pedal drive is not installed. Q: What can I use to hold the 11.5 Feelfree lure overdrive on my roof rack? A: You can use either J-Cradles for a system like the Malone Saddle Up Pro to carry the lure. I would suggest taking the pedal system out when transporting it though, to save on weight and to avoid damage! Q: Does this include the seat adjustment kit mentioned in the video? A: Hey there, we appreciate the question! The seat adjustment kit is sold separately.